The one who writes …. And the one who feels overwhelmed and doesn’t have time. Just write she says. Just open a new post and let the images, thoughts, feelings and sounds out. I think I don’t have time. I want to fill out my medical insurance claim and file it so i can be done. And I have a class coming up in a couple of weeks that I want to prepare for. I want to get all these things done before I sit down to write. Like having a clean slate! All the time and space I want! But it’s not like that. There is always something happening and life goes by and we don’t write about what matters to us. I feel disheartened, frustrated and have such a deep longing for creativity and self expression! Would you please write about the walk we went on this afternoon? It doesn’t have to be long. Just to get the gears going again. It was such a beautiful walk! This afternoon I went for a walk. It was still early. The days are so noticeably shorter now that starting a walk around 1:30 pm somehow feels like 4:00! Thanks to the autumn sun the air was finally warmer than it had been earlier in the day. I went to the nearby park and on the way I was once again touched by the beauty of the colors in the trees surrounding me. The exquisiteness that has inspired so many painters for ages. It was as if i were walking through an Impressionist painting. I can imagine them out there, the Monets and Degas, dressed in their usual dark clothes in such a contrast to the paintings they created. Standing at their easels on a Sunday afternoon somewhere in, or near Paris where the leaves would be as vibrant as they are here. I walked along the path and then I heard it. The unmistakable sound of fall. The one that is a constant throughout my life. The rustling of dry leaves beneath my feet. With this moment of awareness all my senses were wide awake. The crackling sound, the sweet pungent scent, the light and shadows playing amongst the trees and branches and my feet gently dragging through the softness of it all. 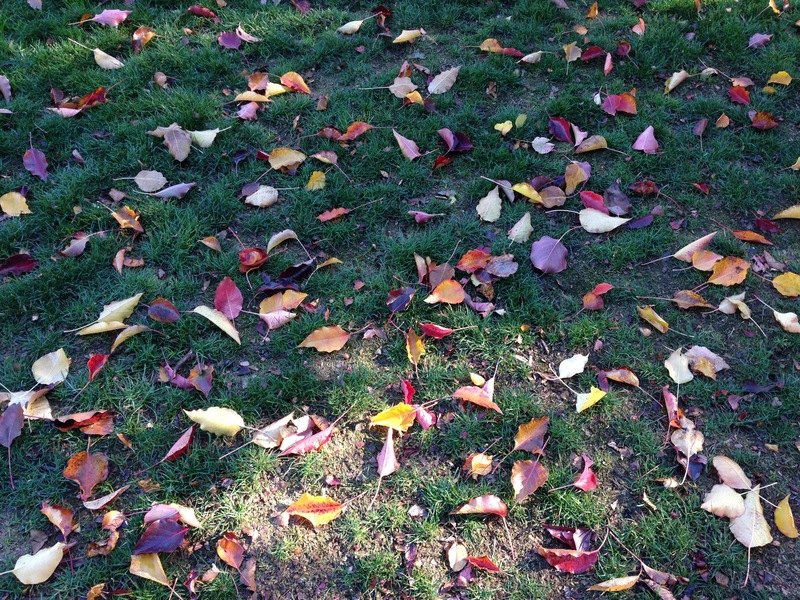 Childhood memories of jumping into piles of leaves and tossing them in the air. Images of fall and winter rushing by. Whitefish, Montana, a place where the mountain side is dotted with snow ghosts in the winter as the bears sleep below the surface, sustained by all the huckleberries they took in during the summer. Fall in New England when i was a teenager. The colors and scent like a thread weaving itself throughout my life. When it comes back it is unmistakable, and it pulls me back through time and places. Places where winter is clearly defined, the temperature drops dramatically and it gets cold! I mean cold! The days are significantly shorter and the sun much lower in the sky. And then there are the places where the change to winter is barely noticeable. Perhaps it’s time for long sleeves. Maybe a sweater or a shawl. At Amma’s ashram in Southern India some of the locals wear ear muffs and ski caps. To me this is such an amazing sight as I delight in finally feeling a bit more comfortable with the cooler climate! The days are around an hour or so shorter in the winter, and the clocks don’t change. I come back from my journey through time and space and notice the leaves around me. I feel awed by what i see. My mind goes quiet and still in the face of such beauty. It’s as if all of nature and the earth are contained in these leaves. It is a perfect moment. Okay i am starting to feel antsy. I have a call in 20 minutes. I think this is an okay place to stop. Yep. This is great. How is it for you? Its okay. I love the memories and being in ‘it’ as i write and at the same time i can’t help but wonder ‘why bother’. I think i just got something! When I used to paint canvases I always had a level of frustration because I couldn’t reproduce what I saw out there or within me the way I fully felt it. I could just never grasp the fullness of it all. Maybe this is the same with writing. I just can’t capture, write down, the fullness, rawness, everything that I experience. I can’t really put into words so much of what I experience. Like being tongue tied. It’s like I can’t even capture it, let alone write it down! 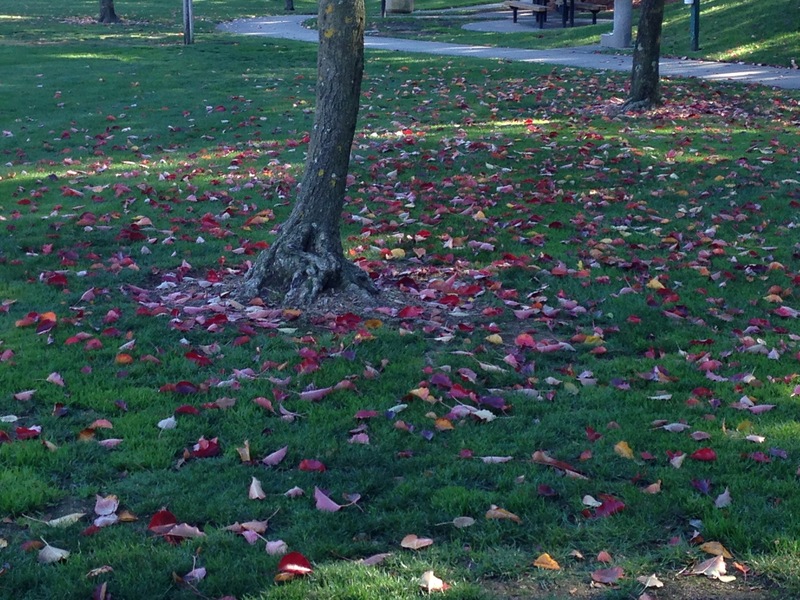 Like when I was in the park, seeing the leaves, standing in them, dragging my feet through them…. It’s like time stops and everything is crystal clear and there is a moment of oneness. How do you write that? I don’t know… all I know is you keep writing. Even if it’s a couple of words. You keep the juices flowing and you touch that precious creative part inside yourself. You let her know that she matters. That her creativity, inspiration, sensitivity matter. That you love who she is and how she sees, experiences the world. Yeah. Thanks for hanging in here with me and encouraging me to write today. Hi Nitya, I am glad you enjoyed the walk. I hope you are settling in well and enjoying the a/c. I hear there are ceiling fans in the bhajan hall! I imagine the breeze is much appreciated. It was worth the effort Arati, and you evoked some lovely sensations in your descriptions. Well done the muse, whoever you are. Thanks Hariod. I enjoy hearing from you and the encouragement that i receive in your words. Ahhhh, the muse …. she is amazingly creative! She never gives up, no matter how many obstacles and excuses her counterpart, the one who thinks we don’t have time, we’re not good enough…. puts in our way. One of my ongoing inner conflicts. To write/paint/dance …or to busy myself with anything that can get in the way of the above. Very nice. In fact, this is great and just what I needed to read today. I hope your days are blessed. Thank you Mitsu. I am happy to hear that what I wrote was what you needed to read today. It feels so great to contribute to the well being of others. May your days be blessed too.